Besides the driver, the next most important part to the team is the crew chief. A crew chief is the one who makes sure that all the mechanical parts of the car are kept in top shape and that the car goes down the racetrack quickly and safely. Frank Cicerale is the crew chief for Tax Bracket Racing, and performs his job beautifully. Frank originally started his racing career while back in high school in the late 1960�s with a 1969 Chevrolet Chevelle SS396. After a lengthy layoff, he got back into it when he bought his current car, a Super Pro 1965 Chevrolet Nova. He had limited success with the car in the time that he ran, making it to one final. In 1989, the motor expired in the car, and paved the way for his son�s to start their careers. 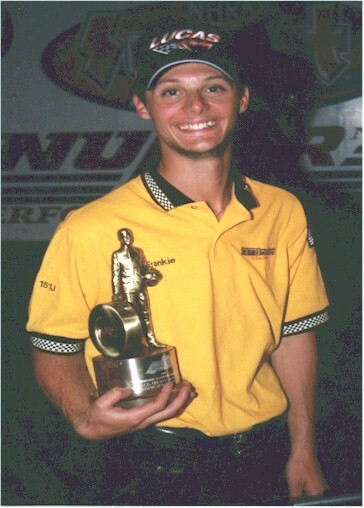 He gave up his racing, and in 1993 bought the Half-Scale built Jr. Dragster for Frankie and Vinnie as a Christmas present. Then it was off to the races. Frank is the crew chief for a Jr. Drag Racing team that has captured three Island Dragway track championships and has finished one-two in the points the past three years. When it comes to dialing a Jr. Dragster, there in none the better. Soon, Frank is looking to get back to his car and having the same fun that his son�s are now enjoying. Until then, with Vinnie doing the driving chores in the Jr. Dragster, Frankie piloting the Super Comp dragster and his 1968 Chevy Nova, and Dad turning the wrenches and dialing the cars, the Tax Bracket Racing team is going to be tough to beat.